We all know that there is nothing healthier and more therapeutic than going for a walk or a hike, and there are hundreds of places that you can go hiking here in South Australia. You may be a seasoned hiker or someone that enjoys hiking on the weekends every now and then. Injury and discomfort has ruined many a hikers plans, making it difficult for them to complete a trail! There’s no need to despair…. there are lots of things that you can do to make sure that your body doesn’t get injured, when you’re walking over long distances. To avoid enduring injuries when you’re hiking, it’s important to consider the most typical types of hiking injuries and how they can be avoided. 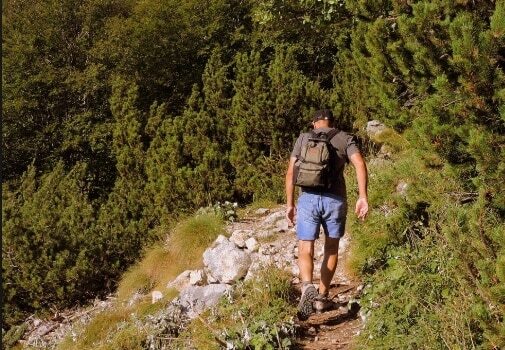 Hikers frequently suffer from lower back, shoulder and neck pain. Those hiking over long distances with poor lower back and neck postures, poor core strength and flexibility, are susceptible to injury and will become more uncomfortable the more they walk. The added pressure of an uncomfortable backpack, that does not sit on a hiker’s back properly, can also add to the discomfort of the hike. Backpack positioning has a significant effect on neck postures which you wouldn’t think would be affected by walking. For weekend walkers it’s often what they do during the week that can lead to injuries whilst they are walking. If you have an office job and sit at a desk for long periods of time, you can develop stiffness and lose mobility in your lower back joints, and muscles can become rigid. Prolonged sitting can cause a tightening of your lumbar erectors, hip flexors and hamstring muscles, which in turn can affect your posture and biomechanics while you walk. A series of stretches that have been prescribed by a Physio to reduce tightness in these areas, may help to decrease these problems. Stiffness in the neck that has built up from being seated at a computer screen over long periods of time can be heightened when carrying a large backpack. Once again, in preparation for a hike, stretches can be done to decrease the likelihood of experiencing neck and shoulder pain. Choosing a backpack that has been properly fitted to suit your back will help to reduce lower back and neck pain. Once you have made sure that it fits you properly, it’s important to pack the backpack properly, so that the weight of the backpack is being primarily carried at the pelvis and not dragging your shoulders down. The backpack should be sitting near your body and you should pack the heaviest items as close as possible to your spine. To get your backpack fitted properly go to a reputable outdoor store that specialises in hiking gear. If you already have a backpack and you’re not sure if it fits you properly, you can bring it into your local practice and we’ll make sure that it has been adjusted correctly. It is not uncommon for hikers to experience knee and foot pain whilst they are hiking, in particular when they have been travelling over long distances or using heavy packs. Lower limb pain can be caused by poor biomechanics at the foot and knee, inadequate strength in leg muscles that support your joints, and obviously the heavy loads that some hikers carry. Wearing a supportive pair of hiking shoes is the first step in helping to reduce lower limb issues. People have different opinions on this from wearing trail running shoes, to ankle supportive leather boots. Finding the right solutions depends on your feet, experience and the type of walking that you’re doing. If you have a pair of hiking boots and you’re unsure as to their effectiveness see either your Podiatrist or Physio. Bring in your shoes and get an assessment of your overall biomechanics as well as looking at your gait. Even if you’re wearing the correct footwear, you can still experience knee and foot pain. This is the result of putting pressure and dependence on the muscles around your hips, knees and feet. This can be further complicated if you suffer from poor core stability and posture. As we tire after we have been walking over long distances, these issues can compound and result in greater knee and foot pain. Specific training and conditioning exercises can greatly help these issues. Seeing a clinician to properly diagnose where you are weak, tight and inflexible and then developing a specific program tailored to your needs is the key to staying healthy whilst you walk. And it’s not just before you walk, but also whilst you are walking or on a hike. From time to time we may suffer from an acute hiking injury where we may roll an ankle or twist a knee. Sometimes these injuries are just overuse injuries due to walking or heavy loads. In these instances it’s important to remember the RICE rules. These are rest, ice, compression, and elevation. If you do happen to experience an acute injury whilst you’re hiking, seeing a Physio can help you to diagnose what the problem is, and map out a plan to assist with your recovery. Hiking is an awesome way to explore the great outdoors, visiting your Physio to get some assistance with the above points will help you to get the most out of your hiking expeditions.